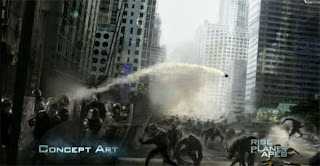 allround geek: The rise of the teaser trailer for THE RISE OF THE PLANET OF THE APES. The rise of the teaser trailer for THE RISE OF THE PLANET OF THE APES. What a stupid title! 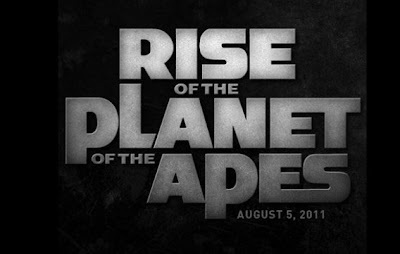 Rise of the Apes was fine (and even Caesar before that) but I guess the marketing department decided that not having "planet" in the title would make it impossible for people to associate this film with the "Planet of the Apes" franchise (as Bill Hicks would say, if you work in advertising go home and kill yourself). Anyway, enough about the stupid title. 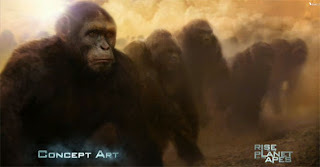 The teaser trailer was released today after a live event WETA DIGITAL did last night to talk about how they plan to create the apes in the film (you can watch part of it here). This is the most stupid explanation on how apes came into power. 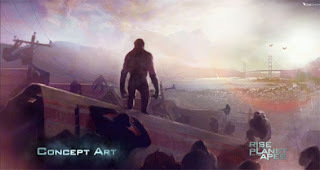 I mean if humans can eliminate other human threats, they can eliminate intelligent ape threat or at least come into some sort of intelligence equilibrium and not the total destruction of human race by intelligent apes. A better explanation would be some sort of human kind destruction (be it nuclear war, physical disaster) and then after hundreds of thousands of years of evolution for the ape species to evolve into a supreme race of humanoids. I just dont buy it. I've already said enough about the movie.